Trump: Russia Will Try To Hack Midterms To Favor Dems - Joe.My.God. 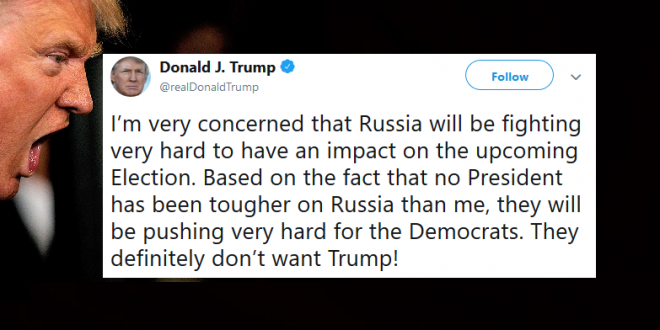 President Trump claimed without evidence Tuesday that Russia would attempt to meddle in the 2018 midterm elections in support of Democrats. Trump was aboard Air Force One headed to an event in Kansas City when he sent the tweet. The entire US intelligence community has been in agreement that Russia meddled in the 2016 presidential election in support of Trump. The community has also warned that Russia will attempt to influence the 2018 midterms but has provided no evidence that Russia would side with one political party.